For other people named Kevin Johnson, see Kevin Johnson (disambiguation). Kevin Maurice Johnson (born March 4, 1966) is an American former professional basketball player and Democratic Party politician who served as the 55th Mayor of Sacramento, California. He is the husband of educator Michelle Rhee. Elected in 2008 and re-elected in 2012, Johnson is the first African American to serve as Mayor of Sacramento. Prior to entering politics, Johnson was a professional basketball player in the National Basketball Association (NBA). Johnson played point guard for the Cleveland Cavaliers during a portion of his rookie year, and for the Phoenix Suns for the remainder of his NBA career. During his 12-year playing career, Johnson was a three-time NBA All-Star and four-time second team All-NBA selection, and held numerous records for the Phoenix Suns organization. At the University of California, Berkeley, Johnson was named a two-time All-Pac-10 Conference player and an honorable-mention All-American by the Associated Press. Johnson holds a B.A. in Political Science from U.C. Berkeley that he completed after his initial retirement from the NBA. Since founding St. HOPE in 1989, Johnson has been active in education reform. As Mayor of Sacramento, Johnson launched two education initiatives: Stand UP and Sacramento READS!, to benefit students in Sacramento. Johnson also helped to deter the Sacramento Kings basketball team from moving to Anaheim, and, later, to Seattle, Washington. Johnson, the son of Georgia West and Lawrence Johnson, was born March 4, 1966, in Sacramento. After his father died in a boating accident when he was three, Johnson was raised by his grandparents, the Peat family. He attended Sacramento High School, where he starred in both baseball and basketball. In his senior year, Johnson led the state of California in scoring (32.5 ppg) and was named the Northern California Player of the Year. Johnson accepted a scholarship to play basketball for the University of California, Berkeley. As a four-year starter, Johnson ended his college career in 1987 as the school's all-time leader in assists (since eclipsed by Jason Kidd), steals, and scoring (since eclipsed by Lamond Murray, Sean Lampley, Patrick Christopher, Joe Shipp and Jerome Randle). Johnson was named to the Pac-10's All-Conference First Team in his junior and senior seasons, averaging 17.2 points and 5.0 assists in his final year. He led Cal to the program's first post-season appearances in 26 seasons with NIT bids in 1986 and 1987 and was the first player in the Pac-10 Conference to post a triple-double. In 1992, Johnson became the first Golden Bear to have his jersey (No. 11) retired. Johnson briefly played for Cal's baseball team and the Oakland Athletics drafted him as a shortstop in the 23rd round of the 1986 MLB draft. After playing a couple games with Oakland's minor-league team in Modesto, California during the summer of 1986, Johnson ended his baseball career, finding the road to professional baseball more arduous and risky compared to basketball. Following his senior season of college basketball, the Cleveland Cavaliers selected Johnson with the seventh pick in the 1987 NBA draft. Originally drafted by Cleveland to challenge the incumbent point guard Mark Price for the starting spot, Johnson found himself playing limited minutes as Price's backup during the 1987–88 NBA season. On February 28, 1988, Johnson, Mark West, Tyrone Corbin, and a future draft pick were traded to the Phoenix Suns in exchange for forward Larry Nance, Mike Sanders, and a future draft pick. Adjusting quickly to the change of scenery and much-increased playing time, Johnson excelled and the league named him the NBA Rookie of the Month for April 1988 as he averaged 15.1 points, an 86.4% free throw percentage, 10.6 assists, and 5.6 rebounds. In his first full season with Phoenix, Johnson grew into one of the game's elite players, averaging 20.4 points, 12.2 assists, a 50.5% field goal percentage, and an 88.2% free-throw percentage. With those numbers, Johnson joined Magic Johnson and Isiah Thomas as the only players in NBA history to average at least 20 points and 12 assists in a season. His rapid improvement earned him the 1988–89 NBA's Most Improved Player Award. The 1988–89 season was the first of three straight seasons in which Johnson averaged at least 20 points and 10 assists, joining Oscar Robertson and Isiah Thomas as the only players in league history to accomplish that feat. It also represented the beginning of a new era for the previously moribund Suns' franchise. In K.J. 's first seven full seasons in Phoenix from 1989 to 1995, the Suns won the most regular season games in the NBA (394, an average of 56 and never fewer than 53), constituting the only club to win at least 50 every year during that span, and they won the second-most playoff games (46), trailing only the Chicago Bulls. Johnson received berths to the NBA All-Star Team in 1990, 1991, and 1994. In the 1991 All-Star Game in Charlotte, Johnson wore number 41 instead of his familiar number 7. NBC announcers Bob Costas and Mike Fratello speculated that the decision represented K.J. 's quiet way of honoring teammate Mark West, the Suns' stoic, largely unrecognized center who thanklessly executed the dirty work on the glass and in the paint. In the 1991 NBA All-Star Game, Johnson started alongside Magic Johnson in the Western Conference backcourt. In anticipation of the game, the Sporting News asked whether K.J. may have surpassed Magic as the best player on the court. The previous spring in the 1990 Western Conference Semifinals, Johnson led the Suns past Magic's league-best, 63-win Los Angeles Lakers, four games to one. Over the last two games, Johnson closed out the series by averaging 33.5 points and a dozen assists as the Suns won both Game Four and Game Five, with K.J. vastly outplaying Magic Johnson in the fourth quarter of both contests. Indeed, Johnson's clutch performances led Hall of Fame center and NBC commentator Bill Walton to later remark, "Kevin Johnson ... really came to the top of this league in the 1990 playoffs when he waxed Magic Johnson and the Lakers in the early rounds. Kevin Johnson—and the Suns—taking care of business in 1990, four to one over the Lakers ... Kevin Johnson just totally outplaying Magic." Johnson's performance during the 1990 playoffs led the Suns to a second consecutive berth in the Western Conference Finals as Phoenix became the only team to ever defeat John Stockton's Jazz (55 wins) and Magic Johnson's Lakers (63 wins) in the same postseason. Johnson made the playoffs every year of his career after his rookie season, reversing the fortunes of the perennially losing Phoenix Suns. The 1992–93 Suns, led by Johnson and new teammate Charles Barkley, posted an NBA-best 62–20 record and managed to make it to the NBA Finals, where they lost to the Michael Jordan-led Chicago Bulls four games to two. Johnson averaged 17.8 points and 7.9 assists in the playoffs and established an NBA record for Finals minutes played by logging 62 minutes in Game 3 (a 129–121 triple-OT victory) vs. the Bulls. But even before Johnson played his first regular season game with Charles Barkley, he suffered an undiagnosed hernia in October 1992 when he attempted to lift heavy-set rookie teammate Oliver Miller off the ground during warmups before a preseason game. By the middle of the 1995–96 season, Johnson had suffered a second undiagnosed hernia. Primarily due to the groin, hamstring, quadriceps, and other muscle strains stemming from these undiagnosed hernias, Johnson missed 109 regular season games during his four seasons with Barkley from 1992–93 through 1995–96 (although he only missed one playoff game during his entire career). When diligent off-season workouts during the summer of 1996 failed to erase the abdominal and groin pain that had been plaguing Johnson since the middle of the last season, the Suns' doctors finally diagnosed the second hernia just after the start of training camp in the fall of 1996. Then, during surgery to repair the hernia, the Phoenix doctors discovered the second, "hidden" hernia that had existed for four years. Despite the undiagnosed hernia problems, K.J. continued to thrive in the postseason like few other point guards in the 1990s. In 1994, he averaged 26.6 points and 9.6 assists in the postseason, scoring 38 points three different times in ten games. In 1995, after an injury-riddled regular season, Johnson returned to form in the postseason. He averaged 24.8 points on 57.3% shooting from the field and 9.3 assists in ten games, including 43 points (18–24 FG) with 9 assists in game four of the Western Conference Semifinals versus Houston and 46 points (21–22 FT) with 10 assists in game seven. During that series, K.J. sank more three-pointers (5) than he'd hit in the entire 1994–95 regular season (4). In game four of the previous year's series with Houston, Johnson completed a remarkable play, driving the baseline and dunking over Rockets' center Hakeem Olajuwon. The shot became an oft-played highlight for the ages and was part of a second consecutive 38-point, 12-assist effort by the point guard. In the summer of 1994, Johnson played with the U.S. national team, otherwise known as Dream Team II, in the 1994 FIBA World Championship, reuniting with old teammate and point guard rival Mark Price to win the gold medal. Johnson led Dream Team II in both total assists (31) and assists per game (3.9), while shooting 47.1% (16–34) from the field and 50.0% (16–32) on two-point field goal attempts. The U.S. head coach, Don Nelson, stated, "I really like having KJ on the court. The thing that stood out is how he sacrificed his scoring to be a distributor of the ball and make his team win. We didn't need his offense on this team. We did need his defense, penetration and assists. He gave us all three." Johnson retired after the 1997–98 season, but returned briefly during the 1999–2000 season to replace the injured Jason Kidd during the playoff run. Johnson helped the Suns win their first playoff series in five years. After Phoenix lost in the second round to the Los Angeles Lakers, he retired for the second and final time. Three-time NBA All-Star – 1990, 1991 (when he started the game), and 1994. Five-time member of All-NBA Teams – 1989 Second Team, 1990 Second Team, 1991 Second Team, 1992 Third Team, 1994 Second Team. Named NBA Player of the Month for February 1989 and April 1997; he was the runner-up for the award in March 1989 and March 1997. Named NBA Most Improved Player in 1989. In Johnson's first seven full seasons in Phoenix (1988–89 through 1994–95), the Suns won the most regular season games in the NBA (394, an average of 56—the only team to win at least 50 in each of those years) and the second-most playoff games (46, trailing only the Chicago Bulls). If one grants the same point value to all assists (play-by-play data is not available prior to the 1996–97 season) and accounts for both assists and points scored, Kevin Johnson created the fourth-most total points in the NBA over a nine-season span from 1988–89 through 1996–97, behind only John Stockton, Karl Malone, and Michael Jordan. The next six players in the top ten during those years were Scottie Pippen, Mitch Richmond, Hakeem Olajuwon, Patrick Ewing, Clyde Drexler, and Charles Barkley. The only one of those players not currently in the Naismith Memorial Basketball Hall of Fame is Kevin Johnson. Ranks third all-time in assists per game started (10.0), behind only Magic Johnson (12.2) and John Stockton (11.2). First player in NBA history to average at least 20.0 points, 10.0 assists, a .500 field goal percentage, and 2.0 steals in a season (in 1990–91). He has since been joined in that regard by Chris Paul (in 2008–09). One of only three players in NBA history (along with Isiah Thomas and Magic Johnson) to average at least 20.0 points and 12.0 assists in a season. One of only three players in NBA history (along with Oscar Robertson and Isiah Thomas) to average at least 20.0 points and 10.0 assists per game in three consecutive seasons. One of only four players in NBA history (along with Robertson, Thomas, and Magic Johnson) to have averaged at least 20.0 points and 10.0 assists per game in three different seasons. Along with Magic Johnson, one of only two players in NBA history to have twice averaged at least 20.0 points and 10.0 assists per game over the course of a season, while shooting at least .500 from the field. The only other player to produce 20.0/10.0/.500 over the course of a single season is Chris Paul. Along with Magic Johnson, one of only two players in NBA history to average at least 20.0 points, 12.0 assists, and a .500 field goal percentage in the same season. Along with Magic Johnson, one of only two players in NBA history to average at least 20.0 points, 10.0 assists, and a .510 field goal percentage in the same season. First player in NBA history to rank in the top three in assists per game and three-point field goal percentage in the same season. (Johnson ranked third in assists per game in 1996–97 at 9.3 and third in three-point field goal percentage in 1996–97 at .441.) The only other players to accomplish the feat have been John Stockton in 2000–01 and Steve Nash in 2006–07 and 2007–08. One of only four players in NBA history to rank in the top five in assists per game, three-point field goal percentage, and free throw percentage during a season at some point in their careers. Johnson placed second in assists per game in 1991–92, third in assists per game in 1988–89, 1989–90, and 1996–97, fourth in assists per game in 1990–91, fifth in assists per game in 1993–94, third in three-point field goal percentage in 1996–97, and fifth in free throw percentage in 1997–98. The other three players to accomplish the feat are Steve Nash, Scott Skiles, and Stephen Curry. Recorded the third-most seasons averaging at least 18.0 points and 9.0 assists with seven (tied with Chris Paul), behind only Oscar Robertson (nine) and Magic Johnson (eight). Recorded the second-most seasons averaging at least 19.0 points and 9.0 assists with six (tied with Chris Paul), behind only Oscar Robertson (eight). Averaged at least 20.0 points and 9.0 assists in a record 5 different playoff runs (1989, 1990, 1992, 1994, 1995). All 5 of these playoff runs went past the first round and lasted at least 8 games. One of only three players in NBA history (along with Oscar Robertson and Isiah Thomas) to average at least 23.0 points and 11.0 assists in multiple playoff runs. The only player in NBA history to average at least 23.0 points and 11.0 assists in multiple playoff runs that lasted longer than the first round or more than four games (1989 and 1992). Johnson would have averaged at least 23.0 points and 11.0 assists in the 1990 Playoff run, but only played 9 and 14 minutes in his first and last game of the 1990 Playoffs due to illness or injury, which brought his averages down. Excluding those 2 games, Johnson averaged 23.1 points and 11.4 assists in the 1990 Playoffs. Along with Magic Johnson, one of only two players in NBA history to average at least 23.0 points and 12.0 assists in a playoff run that lasted longer than the first round or more than four games (1989). Along with Magic Johnson, one of only two players in NBA history to average at least 20.0 points and 10.0 assists in 3 playoff runs past the first round (1989, 1990, 1992). Magic Johnson did this a record 4 times (1986, 1987, 1990, 1991). NBA record holder for minutes played in an NBA Finals game – 62 minutes in 1993 vs. Chicago Bulls. In Game Seven of the 1995 Western Conference Semifinals, set a new record for the most consecutive free throws made in a playoff game with 21 (a record later tied by Paul Pierce in 2003 and broken by Dirk Nowitzki in 2011). In Game Seven of the 1995 Western Conference Semifinals, had the second-highest scoring output in a Game 7 with 46 points, behind Dominique Wilkins in Game 7 of the 1988 Eastern Conference Semifinals and Sam Jones in Game 7 of the 1963 Eastern Division Finals. Wilkins and Jones share the highest scoring output of 47 points in a Game 7. Only player with at least 45 points and 10 assists in a Game 7 as he posted 46 points and 10 assists in Game 7 of the 1995 Western Conference Semifinals versus the defending and eventual champion Houston Rockets. No other player has recorded at least 45 points and 7 assists in a Game Seven. The closest was LeBron James in 2008 with 45 points and 6 assists. Among players who have played in at least three Game Sevens, Johnson ranks fourth all-time in Game Seven scoring average (31.0, trailing only Michael Jordan at 33.7, LeBron James at 33.2, and George Gervin at 32.0) and is tied for fifth all-time in Game Seven assists average (10.0, even with Steve Nash and trailing only Russell Westbrook at 14.3, Magic Johnson at 14.0, John Stockton at 12.0, and Bob Cousy at 11.3). Kevin Johnson is the only player to rank in the top five (or six) in both categories. Johnson is tied with Oscar Robertson for the most free throws made in a single Game Seven (21). Overall, Johnson shot .933 from the foul line in Game Sevens (42-45, 15.0 FTA per game). Phoenix Suns' all-time leader in free throws made (3,943), free throws attempted (4,691), assists average in a season (12.2 in 1988–89), assists in a season (991 in 1988–89), and assists in a game (25 versus the San Antonio Spurs on April 6, 1994). Inducted into the Phoenix Suns Ring of Honor in 2001. Inducted into the Cal Athletic Hall of Fame in 2000 and into the Pac-10 Hall of Honor in 2003. Became the first Golden Bear men's basketball player to have his jersey retired (No.11) in 1992. Received the Silver Anniversary Award for recognition of his myriad of athletic and professional accomplishments from the NCAA in January 2012. Inducted into the Bay Area Sports Hall of Fame in March 2012. Inducted into the National High School Hall of Fame in July 2012. The Kevin Johnson Corporation includes operations of several subsidiary organizations specializing in real estate development and management, sports management, and business acquisition. A key component of The Kevin Johnson Corporation includes appearances and public speaking engagements for corporations, academic institutions, and community organizations. In 1989, while still an NBA player, Johnson founded St. HOPE (Helping Others Pursue Excellence) as an after-school program for kids in his native Oak Park neighborhood of Sacramento, California. St. HOPE eventually expanded to run as a nonprofit umbrella organization that consisted of three divisions: St. HOPE Academy, St. HOPE Public Schools, and St. HOPE Development Corporation. This encompassed the new vision to be a nonprofit community development corporation whose mission is to "revitalize communities through public education, civic leadership, economic development, and the arts." Johnson served as CEO of St. HOPE until January 2008. The St. HOPE Development Corporation, founded in 1994, has focused its efforts on Oak Park. The Development Corporation has enabled the renovation of a number of projects including a historic bank building that is now a local U.S. Bank branch, a Victorian house that has been converted to office space, and a 25,000 square foot art gallery and retail complex that includes the Guild Theater and 40 Acres Art Gallery. St. HOPE Public Schools is a pre-K-through-12th-grade independent charter school system that provides education to nearly 2,000 students in seven small schools. One of the schools St. HOPE impacted was Sacramento High School (colloquially known as Sac High and now the Sacramento Charter High School), where three generations of Johnson's family including him attended. In October 2002, Sac High was at risk of being shut down and restricted into five smaller schools due to low test scores. But by January 2003, Johnson had raised seed money from the Gates Foundation and drafted a petition to reopen Sac High as an independent charter school. On September 2, 2003 Sac High reopened as Sacramento Charter High School, a charter school with 1,450 students. Since St. HOPE's involvement with Sac High, student performance has improved. In 2010 Sac High's API score improved to 719, compared to 610 in 2006. The number of students who completed all courses required for University of California or California State University Admission also rose between those years from 84% to 90.6%. These improved test scores attracted the attention of a school in New York and St. HOPE eventually expanded into Harlem at the St. HOPE Leadership Academy Charter School which opened in 2008. Since 2007, the decision to expand St. HOPE to New York has been taught as a case study in the Entrepreneurship in Education Reform class at Harvard Business School. Following presentation of the case study, Johnson discusses it over lunch with the Harvard students and faculty. The class works as a feeder program for students to participate in the Mayoral Fellowship Program in Sacramento. On March 5, 2008, Johnson announced he would run for mayor of Sacramento, his hometown, challenging incumbent Heather Fargo. Election day was June 3, 2008. Since no candidate received a majority of the vote in the nonpartisan election, there was a runoff. Johnson garnered the endorsement of the Sacramento Police Officers Association (SPOA), the Region Builders, the Chamber of Commerce, Realtors' Association and Labor Council, among others. Johnson was also endorsed by Sacramento City Council members Steve Cohn (Vice Mayor) and Sandy Sheedy, and by former Sacramento Mayor Jimmie Yee. On June 4, 2008, Kevin Johnson, who led by 8 percentage points, forced a runoff election for mayor versus the two-term incumbent. 374 of 378 precincts were reported, and Johnson was ahead of Mayor Heather Fargo 47% to 40%. Five other candidates split the rest of the vote. The candidates needed more than 50% to win the election. Third place finisher Leonard Padilla endorsed Mayor Fargo on June 4, 2008. Johnson, by late May, loaned his campaign $500,000 and raised $490,000, while Fargo raised $340,000 despite having started fundraising in 2005. Johnson and Fargo had a runoff election in November, won by Johnson. Volunteer Sacramento was launched alongside Cities of Service, a bipartisan coalition of mayors founded in 2009 to encourage public service. As one of the founding cities, Sacramento logged 1.7 million hours of service and created $22 million in economic impact in 2009. In 2010, 3 million hours of service were logged, adding a $70 million economic impact in the region. For these efforts, Sacramento was awarded a City of Service Leadership Grant. For Arts' Sake was launched to increase interest and support of Sacramento's local art. In response to this commitment, Sacramento was chosen by the John F. Kennedy Center for the Performing Arts in Washington, D.C. as the first city in the nation to pilot the "Any Given Child" program. The program is designed to bring equal access to arts programming for children K-8. It currently operates in Sacramento City Unified School District and Twin Rivers Unified School District. Sacramento Steps Forward is an initiative launched to end chronic homelessness in Sacramento. Johnson assumed leadership as Chair of the regional Policy Board to End Homelessness and joined the U.S. Conference of Mayors' Task Force on Hunger and Homelessness in 2009. By 2011, 2,350 households were moved into permanent housing and Sacramento was awarded approximately $6 million through the Homelessness Prevention and Rapid Re-housing Program. Johnson launched the STAND UP education initiative to increase student achievement in Sacramento schools with $6 million being raised to bring education reform and innovative programming to Sacramento. In 2010, Johnson was the Founding Chair of the U.S. Conference of Mayors' Public Schools Task Force and the Co-Chair of U.S. Secretary of Education Arne Duncan's Mayoral Advisory Council. The Greenwise initiative was launched to diversify economic development, go green, and promote Sacramento as the "Emerald Valley." Sacramento was selected by President Obama to participate in the Better Buildings Challenge which provides federal investment to achieve energy efficiency. Sacramento committed to reducing energy use 20% by 2020 in 12 million square feet of building space. The Greenwise initiative works to establish programs to achieve this commitment. Think Big was launched to facilitate the economic development of Sacramento, including the construction of a new entertainment and sports complex. Think Big oversees progress at the downtown Railyards, an area that has been left unutilized since the 1980s and is currently one of the largest urban infill project in the country. In 2011 Johnson launched another education initiative, Sacramento READS!, in response to the "literacy crisis in Sacramento." Beginning in 2011, Sacramento READS! was designed as a 10-year initiative to ensure all children in Sacramento can read at grade level by the end of 3rd grade by focusing on school readiness, attendance, and limiting summer learning loss. The City-Schools Collaborative was launched to better align city services with school districts to maximize resources to support public education. The Gang Prevention Task Force was launched to form a three-year city-county partnership to reduce gang violence through school-based and job-training programs. Johnson acquired over $17 million in federal and state stimulus dollars for law enforcement and community policing. 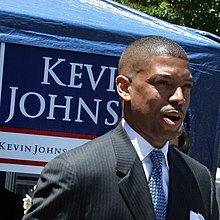 Kevin Johnson announced he would run for reelection for Mayor of Sacramento on September 14, 2011. Election day was June 5, 2012. Johnson was challenged by three individuals: Jonathan Michael Rewers, Leonard Padilla, and Richard Jones. Since Johnson received a majority of the vote (more than 50% of the vote), no run-off was required. Johnson raised at least $841,394 in his reelection bid and spent $500,000 of that on the race. Johnson was endorsed by Sacramento City Council members Angelique Ashby (Vice Mayor), Steve Cohn, and Jay Schenirer. Johnson also received support from the Sacramento Police Officers Association, the Sacramento Area Firefighters Local 522, and the Sacramento Metro Chamber along with California Senate pro Tem President Darrell Steinberg, Governor Jerry Brown, and Senator Dianne Feinstein. Johnson defeated the three other candidates with 58.74% of the votes. In June 2012 Johnson was elected the second vice president of the United States Conference of Mayors (USCM). He became the first Sacramento mayor to be elected to the second vice president position and became the first Sacramento mayor to serve as president, which he was set to assume in 2014. This was the second national leadership position Johnson assumed in 2012, as he was previously elected to the first vice president of the National Conference of Black Mayors, where he assumed the presidency in 2013. After becoming president of the National Conference of Black Mayors (NCBM), Johnson took steps that resulted in the dissolution of the organization. Johnson has served on the board of directors for the University of California Alumni Association, Phoenix Suns Charities, Christian Athlete Ministries, Phoenix Symphony, the School House Foundation, Jobs for America's Graduates (JAG), and on the advisory board for the Caring Institute. Johnson has received numerous awards for his dedication and contributions to his community. In 1991, Former President George H. W. Bush honored Johnson with as the 411th Point of Light recipient in recognition of Johnson's concern and compassion for children and education. In addition to being selected as one of the "15 Greatest Men on Earth" by McCall's, Johnson has received the NBA's J. Walter Kennedy Citizenship Award, the John R. Wooden Lifetime Achievement Award 2008, the Good Morning America Award from Sports Illustrated, the "Most Caring American" award by the Caring Institute, and induction into the World Sports Humanitarian Hall of Fame in Boise, Idaho. During the summer of 1995, a sixteen-year-old girl living in his home alleged that Johnson had molested her. Johnson apologized to the girl when he was confronted by her with the accusation during a phone conversation recorded by Phoenix police. However, he also stated that "what you're saying happened, I'm not entirely agreeing happened." The Sacramento Bee stated that they had received a copy of a proposed settlement agreement, under which Johnson would have paid the girl's family $230,000. After conducting an investigation, the Maricopa County Attorney's Office declined to prosecute, on the grounds that there was not a reasonable likelihood of conviction. On October 8, 2015, press accounts surfaced of a 1996 police video which showed detectives saying there was a likely chance that he was abusing her and others. On April 16, 2008, rival mayoral candidate Leonard Padilla distributed a 2007 report of similar allegations made against Johnson at St. HOPE Sacramento High School. The allegations were investigated by local police, but no charges were filed. On April 29, 2008, a group of female civic leaders including former Sacramento Mayor Anne Rudin, Sacramento Municipal Utility District board member Genevieve Shiroma, and former State Senator Deborah Ortiz demanded the release of the police report on the matter. The teacher to whom the student initially brought the complaint subsequently resigned over the incident, claiming, "St. HOPE sought to intimidate the student through an illegal interrogation and even had the audacity to ask me to change my story." Two classmates and a school counselor confirmed the teacher's version of events. Sacramento Police Chief Rick Braziel responded, saying, "I think the allegations at the school were handled in the way that you would want them handled. Immediately they followed all the normal protocols that they were supposed to follow. I think it was pretty clear there was nothing there... We did ask the young lady whether anyone had influenced her—her answer was no." The Sacramento County Sheriff John McGinness said on May 30, 2008, that Johnson's actions, though ill-advised, were not illegal. On April 9, 2009, Acting U.S. Attorney Lawrence G. Brown announced that St. HOPE Academy had agreed to pay $423,836.50 over ten years in settlement of allegations that it did not appropriately spend AmeriCorps grants and education awards and did not adequately document spending of grants. The settlement amount represented one half of the $847,673 in AmeriCorps funds received by St. HOPE Academy over three years from 2004 to 2007. Johnson, St. HOPE Academy's founder and former CEO, agreed to pay $72,836.50 of St. HOPE Academy's $73,836.50 initial payment. In settlement, St. HOPE Academy acknowledged not adequately documenting a portion of its AmeriCorps grant expenditures, and the Corporation for National and Community Service terminated its September 24, 2008 suspension of St. HOPE Academy and Johnson from receiving federal funds, ending questions about Sacramento's eligibility to receive federal stimulus funds. In 2007, The Sacramento Bee investigated Johnson's real estate holdings in the Oak Park neighborhood of Sacramento, and found that more than half the properties owned by Johnson and his various entities had been cited for various code violations, including for fire risk from overgrown vegetation, dead animals, junk and debris on the properties, and decaying and fire-damaged buildings. A local group, OPUS (Oak Park United against Slumlords) complained that Johnson was "stopping progress" in Oak Park by refusing to develop key properties in the community. Johnson attended a charity event at Sacramento Charter High School on September 21, 2016, when a man approached him and hit him in the face with a pie. Johnson then allegedly assaulted his assailant, later alleging self-defense. The perpetrator, Sean Thompson, was arrested on a felony charge of assaulting a public official and misdemeanor charge of battery on school property. Johnson married Michelle Rhee, the former Chancellor of the District of Columbia School System, on September 3, 2011, in front of 40 people at a Tennessee mountain resort. They had originally planned to get married the year before, but decided to postpone it in the wake of a large amount of media attention to their nuptials. ^ a b c d e "Kevin Johnson". Sports Reference LLC. Retrieved January 20, 2009. ^ "Sports Digest". San Francisco Chronicle. Newbank. May 19, 1987. Retrieved January 20, 2009. ^ "Berry No. 1 On AP All-America Team". San Jose Mercury News. Newsbank. March 11, 1986. Retrieved January 20, 2009. ^ Jeramie McPeek (December 1, 1995). "Kevin Johnson: The Spirit of Giving". ^ "Kevin Johnson". IGS National Advisory Council. ^ Cal's Johnson follow Bo's lead?" ^ "1987 NBA Draft −7- Kevin Johnson, California". ^ "Kevin Johnson". March 31, 2016. Retrieved April 7, 2017. ^ "Kevin Johnson". RealGM Basketball. Retrieved June 28, 2012. ^ "Kevin Johnson". Sports Reference LLC. Retrieved January 20, 2009. ^ See NBC's telecast of Game Seven of the 1995 Western Conference Semifinals, Houston at Phoenix, during the second quarter, on May 20, 1995. ^ Lee Shappell, Phoenix Suns: Rising to the Top with the "Team of Oddities" (Champaign, Illinois: Sagamore, 1993), 115. ^ "Surgery for Suns Guard – New York Times". Nytimes.com. September 28, 1996. Retrieved December 13, 2012. ^ "Internet Archive Wayback Machine". Web.archive.org. December 14, 2001. Archived from the original on December 12, 2004. Retrieved December 13, 2012. ^ "Internet Archive Wayback Machine". Web.archive.org. February 7, 2002. Archived from the original on September 25, 2005. Retrieved December 13, 2012. ^ "Kevin Johnson posterize Olajuwon 1994 WCSF G4". ^ "Internet Archive Wayback Machine". Web.archive.org. February 7, 2002. Archived from the original on April 22, 2012. Retrieved December 13, 2012. ^ Brian Burnsed (January 13, 2012). "Former NCAA stars shine at Honors Celebration". Archived from the original on May 23, 2012. ^ Lesley Miller (August 12, 2008). "St. HOPE Public Schools Opens First National School in Harlem" (PDF). ^ Alex Tresniowski (December 15, 2003). "Rebound Artist". People. ^ "Reopening as a Charter School" (PDF). The Center for Comprehensive School Reform and Improvement. Archived from the original (PDF) on October 6, 2014. Retrieved July 3, 2012. ^ "Executive Summary School Accountability Report Card, 2010–11" (PDF). ^ "The Role of Social Entrepreneurship in Transforming U.S.A. Public Education" (PDF). Harvard Business School. Retrieved July 13, 2012. ^ Terri Hardy; Marcos Bretón (March 5, 2008). "Kevin Johnson announces he is running for mayor". The Sacramento Bee. Archived from the original on March 6, 2008. Retrieved March 5, 2008. ^ Mary Lynne Vellinga (April 28, 2008). "Kevin Johnson endorsed by Realtors". The Sacramento Bee. Archived from the original on August 15, 2013. Retrieved April 28, 2008. ^ a b c "Year One: A Look Back at Sacramento Mayor Kevin Johnson's First Year in Office" (PDF). Archived from the original (PDF) on June 5, 2012. Retrieved June 29, 2012. ^ "Cities of Service and Rockefeller Foundation Award First-Ever "Cities of Service Leadership Grants" to Ten Cities to Hire Chief Service Officers". Cities of Service. January 18, 2010. Archived from the original on June 4, 2011. ^ Jonathan Mendick (December 15, 2009). "Any Given Child survey for arts education". Sacramento Press. Archived from the original on September 20, 2011. Retrieved June 29, 2012. ^ Jonathan Mendick (November 5, 2009). "Sacramento Steps Forward initiative announced". Sacramento Press. Archived from the original on January 12, 2010. ^ "Year Two: A Look Back at Sacramento Mayor Kevin Johnson's Second Year in Office" (PDF). Archived from the original (PDF) on June 5, 2012. Retrieved June 29, 2012. ^ "Hunger and Homelessness Survey – A Status Report on Hunger and Homelessness in America's Cities" (PDF). The United States Conference of Mayors. December 1, 2009. p. 42. Archived from the original (PDF) on December 10, 2009. ^ "Mayor Kevin Johnson Appointed to National Education Task Forces" (PDF). April 26, 2010. Archived from the original (PDF) on April 1, 2013. ^ Jeff vonKaenel (January 6, 2011). "Vision of an Emerald Valley". News Review. ^ Office of the Press Secretary (December 2, 2011). "We Can't Wait: President Obama Announces Nearly $4 Billion Investment in Energy Upgrades to Public and Private Buildings". The White House. ^ Morris Newman (August 12, 2009). "Sacramento Project 'Almost a City in Itself'". The New York Times. ^ "Railyards Redevelopment" (PDF). City of Sacramento. Archived from the original (PDF) on March 22, 2006. Retrieved July 16, 2012. ^ "Our Program". Sacramento Reads. Archived from the original on May 10, 2012. Retrieved July 16, 2012. ^ "Action Plan". Archived from the original on August 1, 2012. Retrieved July 16, 2012. ^ "Mayor; City of Sacramento Voter Information". Smart Voter (June 28, 2012). ^ David Bienick (May 25, 2012). "Sac mayor raises $841k in re-election bid". KCRA. Archived from the original on January 27, 2013. ^ "Moving Sacramento Forward – Mayor Kevin Johnson". Archived from the original on June 25, 2012. Retrieved June 28, 2012. ^ "Sacramento County Election Results – Mayor of Sacramento". Retrieved June 28, 2012. ^ "Who's Funding Kevin Johnson's Secret Government?". September 18, 2015. Retrieved September 18, 2015. ^ a b "Kevin Johnson". IGS National Advisory Council. Retrieved June 28, 2012. ^ "Kevin Johnson to receive John R. Wooden Lifetime Achievement Award" (PDF). February 19, 2008. Archived from the original (PDF) on March 3, 2016. 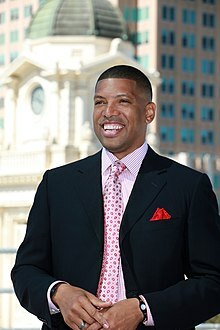 ^ "Can Former Phoenix Sun Kevin Johnson Overcome His Past to Become Sacramento's Mayor?". May 22, 2008. Retrieved May 22, 2008. ^ Hardy, Terri; Korber, Dorothy (May 20, 2008). "Johnson agreed to pay teen girl $230,000, draft of document shows". Archived from the original on December 3, 2008. ^ "The Summer of '95". May 8, 1997. Retrieved May 11, 2008. ^ "Police Video Shows Teen Girl Graphically Accusing Kevin Johnson Of Sexual Abuse". October 8, 2015. Retrieved October 9, 2015. ^ "Women Seek Release of Kevin Johnson Files". KCRA. April 29, 2008. Archived from the original on May 16, 2008. Retrieved May 11, 2008. ^ a b Hardy, Terri; Korber, Dorothy (May 7, 2008). "Investigation of girl's allegations against Kevin Johnson raises questions". The Sacramento Bee. Archived from the original on April 29, 2008. Retrieved May 11, 2008. ^ a b c d Brown, Lawrence G. (April 9, 2009). "United States settles claims arising out of St. HOPE Academy's spending of AmeriCorps grants and education awards" (PDF). Sacramento: U.S. Department of Justice. Archived from the original (PDF) on June 27, 2009. Retrieved July 3, 2009. Lillis, Ryan; Walsh, Denny (April 10, 2009). "U.S. funds can flow to city; Deal to repay grants lifts Mayor Johnson's aid ban". The Sacramento Bee. p. A1. Retrieved July 3, 2009. ^ Ellen Garrison; Jessica Hice (September 21, 2016). "Sacramento Mayor Kevin Johnson assaulted with pie at benefit dinner". sacbee.com. Retrieved September 21, 2016. ^ Staff (September 22, 2016). "Mayor Kevin Johnson beats up protester who pied him". nypost.com. Retrieved September 22, 2016. ^ Reliable Source blog: Michelle Rhee and Kevin Johnson kept their wedding under the radar, The Washington Post (September 7, 2011). Retrieved on November 20, 2011. ^ Reliable Source blog: Michelle Rhee and Kevin Johnson downsize their wedding, The Washington Post (August 25, 2010). Retrieved on November 20, 2011. ^ Sacramento Mayor Johnson, Rhee marry quietly in Tennessee Archived September 25, 2011, at the Wayback Machine, The Sacramento Bee (September 7, 2011). Retrieved on November 20, 2011. Wikimedia Commons has media related to Kevin Johnson. This page was last edited on 14 March 2019, at 09:24 (UTC).